Remembering Tina Collyer. 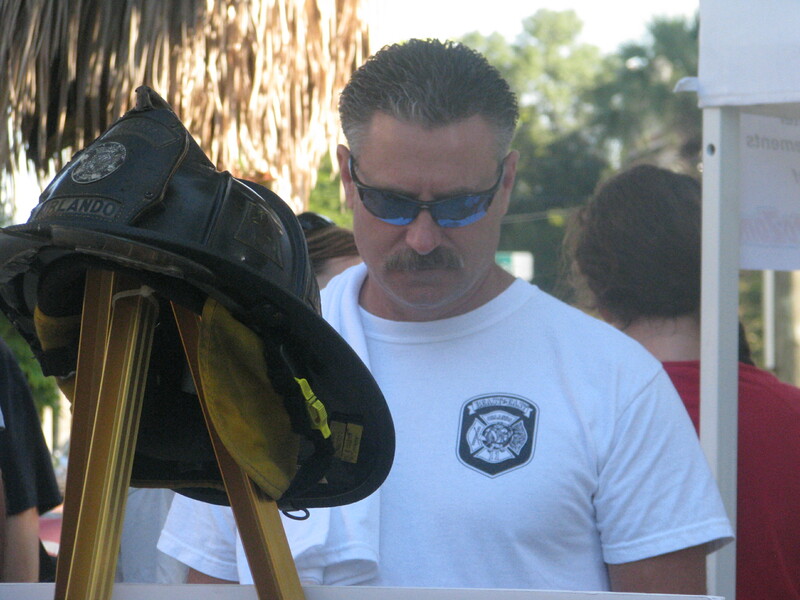 At the event Fire Chief John Miller (pictured here) spoke to friends and family and honored their commitment to keeping Tina's spirit of service alive. Tina’s Turn Out was established by friends and community members in memory and celebration of Tina Collyer’s life. With the proceeds from the inaugural Sept. 24th walk, the Tina Collyer scholarship has reached $9,400 and is almost half way toward becoming a perpetual scholarship. Tina Collyer, a Valencia graduate and an Orlando firefighter, had a passion for helping young Explorers fulfill their dreams of becoming firefighters. Once endowed, the Tina’s Heart scholarship will be earmarked for students, especially Explorers, who wish to certify as an Emergency Medical Technician (EMT) at Valencia College. The EMT-Paramedic Program is designed for students who are interested in providing pre-hospital emergency care to acutely ill or injured patients. A stumbling block for many is the expense of completing the EMT program. Help us with the next steps. Please contribute in memory of Tina Collyer and to help future EMT students. You can contribute online at www.valencia.org, just click on Give Now and make a donation. If you would prefer to mail a check, write ‘In Memory of Tina Collyer’ in the memo field, and send to: Valencia Foundation, 190 S. Orange Ave., Orlando, FL 32801. Thank you, in advance, for your consideration. Every gift, no matter how large or modest, will make a difference to our students. More photos from this event are available on Facebook via Valencia Alumni Association or click here.